Tours Depart from Amsterdam at 8.30, 9.00, 10.00, 11.45, 12.00, 13.15 and 14.45. Keukenhof is open from 8.00 to 19.30, March 22nd to May 13th. Tulips are in bloom from March to May but April is the most spectacular month to see the gardens. We are comparing Keukenhof Gardens Day Trip from Amsterdam Prices from leading ticket suppliers and Try to find you Cheap tickets prices on the market. Take a break from the busy city to visit one of Holland's top Attractions. Open for just 8 weeks each year, the Keukenhof Tulip Gardens are one of the best-loved gardens in all of Europe. Home to over 7 million tulips as well as daffodils and hyacinths, this is a natural work of art which is sure to appeal to even the least outdoorsy person. This full-day tour includes a guided tour of the flower gardens with an English-speaking guide. You may not want to walk all 32 hectares of the flower gardens but you'll still have plenty of time to stroll around the lake, admire some of the 100 flower displays and take photos amid rainbow fields of tulips. On your way to Keukenhof you will visit a bulb farm and see how the bulbs are cultivated. Back in Amsterdam you are invited to take a complimentary 1-hour sightseeing Canal Cruise through the city centre. The perfect tour for nature and flower lovers. This is also interesting for people who would like to see some of the Dutch countryside. Your Experience With Keukenhof Gardens Day Trip from Amsterdam? Visit one of the largest tulip gardens in the world. Be spellbound by beautiful floral displays and extensive tulip fields. Take advantage the of a fantastic day trip which takes you away from the bustling city streets of Amsterdam to the serene nature paradise of Keukenhof. See over 7 million beautiful tulips in bloom. Take a comfortable coach with a local guide from Amsterdam to Keukenhof and later return to Amsterdam. Visit a local factory to learn how the tulip bulbs are cultivated. Have the flexibility to choose your departure time. What Keukenhof Gardens Day Trip from Amsterdam Includes? Transportation to/from Amsterdam and entrance to the Keukenhof Gardens. Private guide and tour of tulip gardens. Visit to the bulb farm. 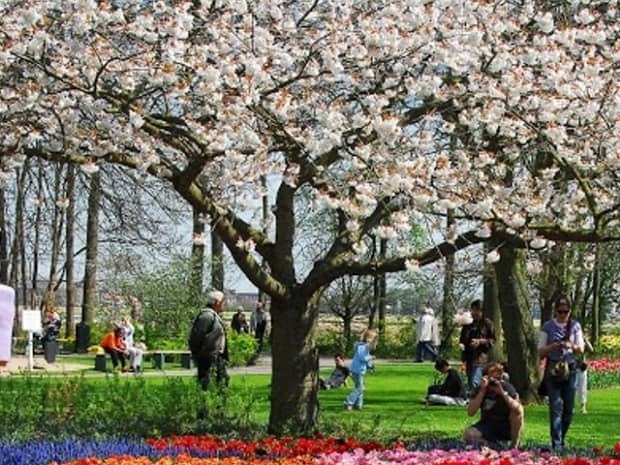 Departure from Central Amsterdam – visit a bulb factory – visit Keukenhof Tulip Gardens – return to Central Amsterdam. A visit to Keukenhof is one of the top things to do in Holland and it's only open for two short months each year so tickets can sell out quickly. Therefore, we recommend booking your tour tickets well in advance, particularly if you are travelling in a group. Travelers Reviews about Keukenhof Gardens Day Trip from Amsterdam? The Keukenhof day trip has a 4.4-star score on Get Your Guide. Customers have said that it is a very well organised excursion and a fantastic day out. On TripAdvisor travellers have given this tour and average score 4.5. Comments agree that the Keukenhof Tulip Gardens are very beautiful. On Viator this tour has a perfect 5 out of 5-stars from over 200 traveller's reviews. Depending on the supplier tickets are refundable between 1 and 7 days in advance. Food, drinks and tips are not included in the ticket price. Children under 3 go free(If sharing parents seat). Departure Point: Lindbergh office on Damrak 26, 300 Metres from Amsterdam Central Staion.